Lau is originally introduced as the branch manager of a profitable Chinese trading company's English operations, and an acquaintance of both Ciel and Madam Red. 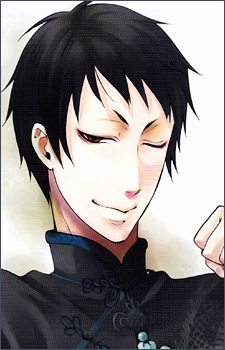 But despite his odd friendship with Ciel, it seems that Lau is in a dubiously legal business himself: his real business is opium, and he runs an opium den that appears to be very well-off. Though he's aware that Ciel technically has some measure of power over such illegal businesses, his response to Ciel's threat to shut him down is merely to cheerfully comment that if that happens, he'll find another way to make a profit. Most of Lau's personal history remains unknown at this point, but he's very familiar with Ciel and far more powerful than he pretends: before anyone else notices, he somehow incapacitates the guards to a mansion that Ciel and the others are sneaking into. Lau is a cheerful enigma. It's a rare occurrence indeed that he wears an expression other than a highly amused smile, even when engaging in dangerous investigations. He enjoys making Ciel's life interesting-- though not, perhaps, in the way that Ciel would like-- by dropping in at odd hours for a cup of tea or to watch Ciel track down a murderer. He has a tendency to refer to people by their titles (Earl for Ciel and Butler for Sebastian). Nothing seems to faze him. He's also quite good at acting like he knows more than he does, and uses this to his own benefit in various situations.